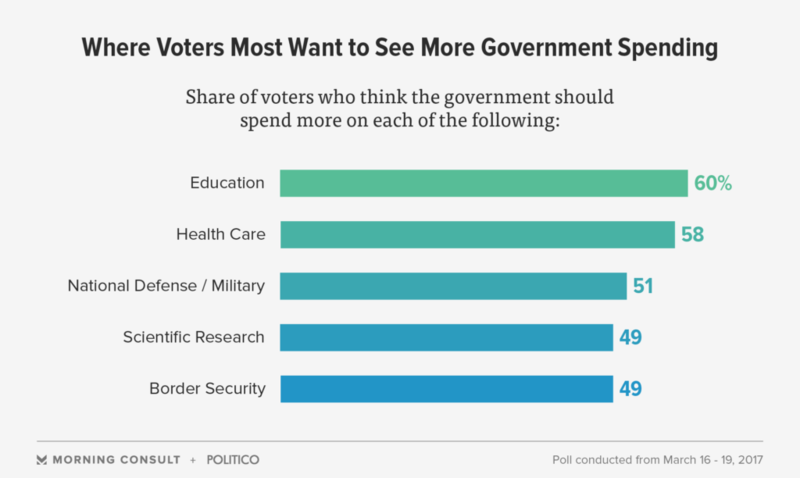 President Donald Trump’s proposed budget cuts to foreign assistance might be popular, but Americans would like to see their government spend more on domestic programs, particularly education and health care. A Morning Consult/POLITICO survey of registered voters conducted over the weekend found popular support for more domestic spending across the board, while more than half of Americans (52 percent) support cutting foreign military aid, and a plurality (45 percent) backs cutting humanitarian assistance. Roughly 6 in 10 Americans support increasing funding for health care programs (58 percent) and education (60 percent). That includes nearly 7 in 10 Democrats (69 percent on education, 67 percent on health care) and more than half of Republicans (54 percent on education, 53 percent on health care). According to the administration, Trump’s budget calls for a $15.1 billion cut from the budget of the Department of Health and Human Services and a $9 billion cut from the Department of Education. It would also slash the State Department’s budget by nearly one-third, targeting foreign assistance programs. The cuts, White House budget director Mick Mulvaney said last week, are aimed to help cover some of the costs of increasing spending on national defense and reducing illegal immigration along the southern border by hiring more law enforcement officials and building a wall. 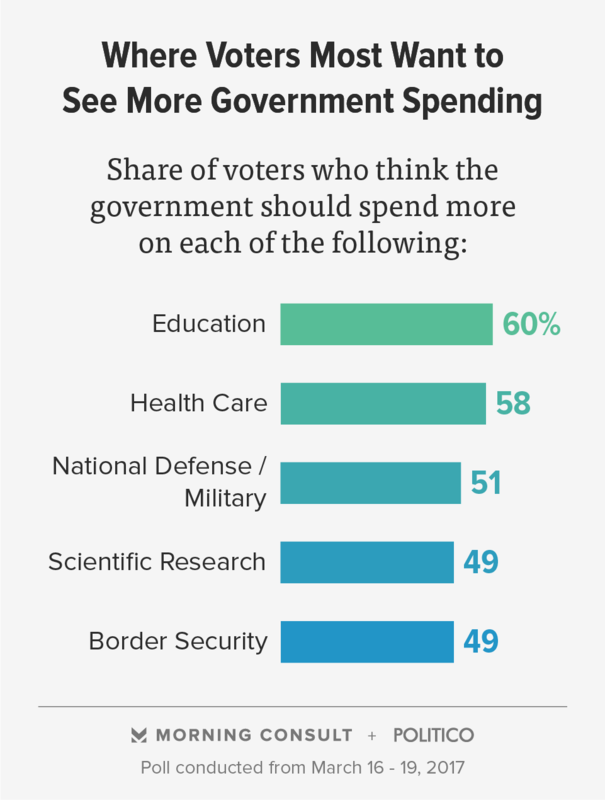 About half of voters support increasing funding for border security (49 percent) and defense (51 percent). But on these issues, top priorities of the Trump administration, the two parties split: 73 percent of Republicans support increases, while most Democrats said funding should either stay the same or be cut. Along with the health and education cuts, Trump also called for cutting the National Institutes of Health by nearly $6 billion and the National Aeronautics and Space Administration by about a percentage point, shifting funding away from climate change research efforts. Americans said they do not support cutting scientific research – in fact, 49 percent of them say it should be increased. That includes 58 percent of Democrats and 41 percent of Republicans. About 3 in 10 Republicans (28 percent) said it should stay the same. Asked about funding for promoting the arts and humanities, which Trump’s budget called for eliminating, voters are split between wanting to cut them or keep funding the same. About a third (32 percent) said they support cuts, while 31 percent said it should stay flat. A quarter of voters (24 percent) said they wanted it increased. The national, online survey polled 1,927 registered voters from March 16-19. It has a margin of error of plus or minus 2 percentage points. Crosstabs are available here.